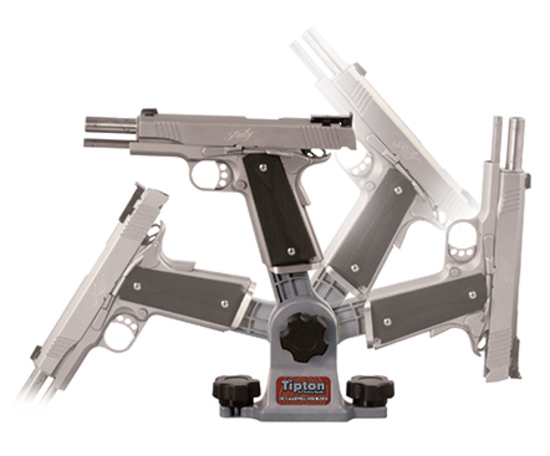 Tipton are a favourite for shooters around the world as they offer a valuable “extra set of hands” for your gun related tasks. Reloaders are your Tipton expert advisors. Shotgunner, rifle shooter, AR Shooter, indeed any shooter needs that extra pair of hands to help when cleaning or just adjusting your firearm. If you have no room and are all thumbs when cleaning then consider the entry level Tipton Gun Butler from Reloaders. This is the Tipton to have if you can’t have bench space for any other. There are distinct advantages, the Tipton Gun Butler holds your firearm so you can clean and adjust. Then of course it holds all the gear you need eg cleaning patches, hardware or scope rings and of course keeps your firearms related tools together. The Gun Butler has a big advantage: it is quick and easy to assemble and fold down to put away in the cupboard freeing up your bench space. 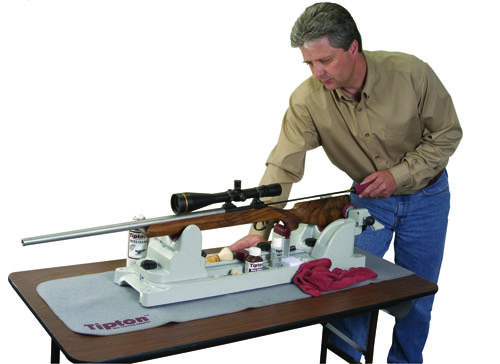 The Tipton Gun Vise is a favourite of many shooters as it has the ability to vice clamp your firearm tightly, without marking the stock, so you can work on your firearms. Tipton Gun Vice from Reloaders another pair of hands in your workshop. 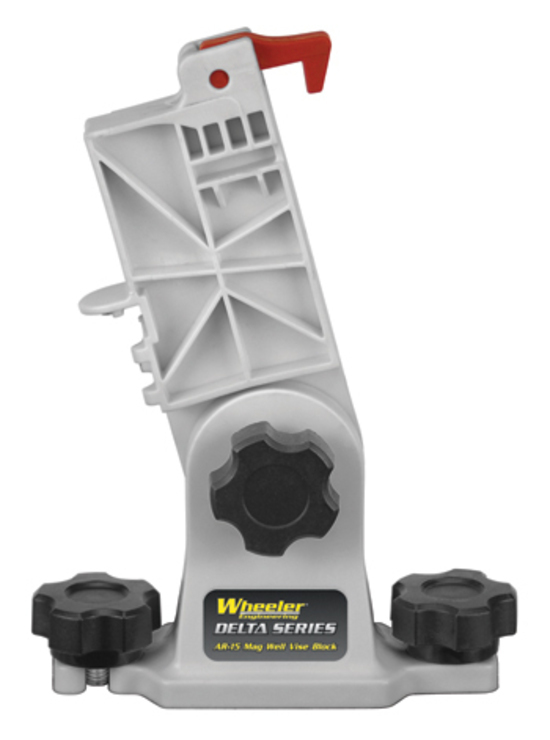 There are lots of reasons why you should look at this model as it can sit on your bench providing a useful place to clean and adjust and also holding all your important tools. Why this Gun vice works is its simplicity and robust nature means all types of work can be done and the risk of your rifle moving, falling or getting damaged is greatly reduced. Reloaders has the Tipton Best Gun vise, and this is our recommendation to you if you have an AR or a handgun as this Tipton vice has an aluminium rail down the center to which the center rifle rest can slide up and down and importantly various accessories can be fitted. For AR shooters this useful accessory can be fitted. It a mag well vice block specially for AR shooters that can support your AR in Breech closed and breech open positions. Yes now you have the answer when cleaning hold the rifle securely with this mag well vise block. 1911 handgun shooters should check out this cool accessory for the Tipton Best Gun vice – a mag well vice. In fact if you are a 1911 shooter you really need to get one, as the Tipton best Gun Vice 1911 mag well vice fits onto the center rail and offers you unprecedented ability to clean and work on your 1911. Top of the range Tipton Ultimate Gun Vice is just what it says: the Ultimate. It is built to last and is the very best gun vice you can own. It has great flexibility as the vice is built on a set of sturdy rails which means the configuration of the stock and fore-end vices can be easily changed. You can have them close together at one end, far apart at either end of the vice – or any combination in between. You choose what suits the support you need for your firearms, shotguns no problem, rifles no problem, AR’s no problem, bows no problem. What is there not to like about the Ultimate Gun Vice? The Ultimate has flexibility and adjustability in spades. The “vice” grips are well designed and it is easy to swap a rifle end to end – Left handers will like this vice the best! The strength of the vice is just great and adjustable feet mean you can get a no-rock platform on any surface. For advice on the Tipton Gun Vice range you need go to Reloaders. Whatever Tipton you choose you will get a well designed product that is resistant to solvents and cleaning agents and will hold your firearms while you maintain them. An extra pair of hands that does not get tired.